I can say with a confidence that I have mastered the art of making pita. 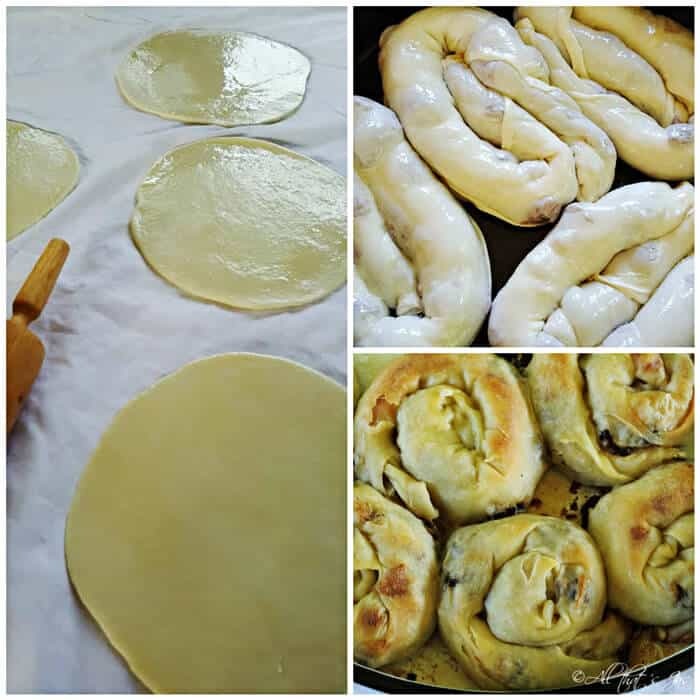 Pita, in Bosnia, is a general term for thin pastry with savory or sweet fillings. The best pita is made with homemade pastry – yufka. 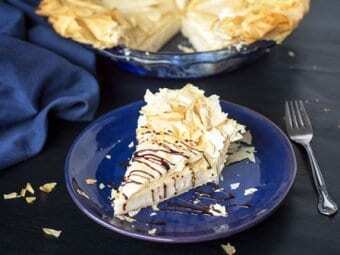 You can use sheets of phyllo dough although it is not quite the same. 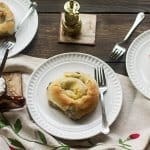 Store-bought phyllo dough is great for layering like in a baklava, but it’s not flexible to be rolled up like a traditional pita. Pita filled with meat is called burek. 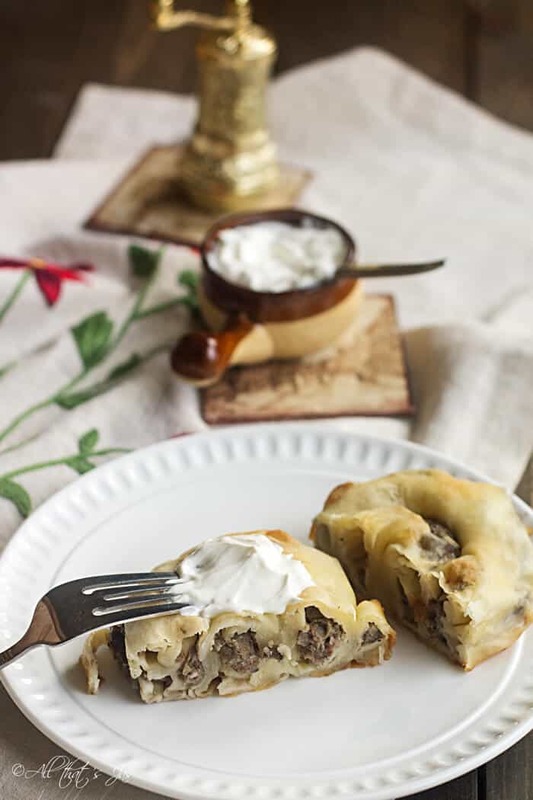 You might remember a recipe for burek with layered phyllo dough I shared a long time ago. That’s the shortcut version when I’m in a pinch yet still want to have pita. The same goes for a pita with cheese and the one with cheese and spinach. I can’t quite put pita into one category. 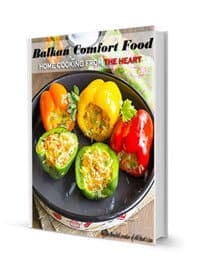 It is kind of a Bosnian street food, but you can eat it as a main dish, an appetizer or snack. It tastes great warm or cold. I have great memories of buying pita from a little shop on the street corner by my high school. When I visited Bosnia this September I had pita almost every day. It tastes even better now that they bake it under a dome. Here’s a peek into the shop (see the tree domes in the back?). Thanks to my dear friend, I’m now equipped with a dome but have yet to use it to bake pita. If you like being challenged in the kitchen, this is a recipe for you. It is lengthy and time-consuming if you’re a beginner in making pita. It takes time and practice to make perfect. Also, and I can’t stress this enough, as with any new recipe please read the instructions several times until you’re confident it makes sense to you. Then proceed to make the dish. In a large bowl, whisk flour and salt to combine (with this method sifting flour is not necessary). Make a small hole in the middle and add water and two tablespoons oil. Start mixing slowly from the middle out, using your fingers or a wooden spoon (I prefer fingers as I have better control and feel for it). Keep adding flour to the middle until mixture forms a soft dough that isn’t sticky. Note: Depending on air humidity, you might have a little bit flour left over or you might need to add some more. The dough should look similar to pizza dough. Combine all ingredients in a small bowl and leave to rest, covered and refrigerated until dough is ready. Line a large table with a clean tablecloth. Remove the rested dough to a lightly floured work surface. Divide into 4-6 smaller even pieces for individual pitas or into 2 balls for one large pita pie. Knead each ball until smooth for about two minutes. Using rolling pin, roll out rounds to a flat circle. Coat each piece with more oil. Take one round of dough and place the edge over your floured fists so the rest hangs in the air. One at the time, move your hands up and down to rotate the dough (similar to the way pizza makers do), working your way around the edge of the dough until its weight allows it to stretch into a larger piece. When it’s too large to handle, place it on the tablecloth. If you are intimidated with this method, just use a rolling pin to stretch the dough as thin as possible without breaking it and then continue to step 5. Using your fingers, gently shake and pull the edge of the dough towards you to stretch out the center, until it’s even and transparent. Take care not to tear holes in the dough. If you do, pinch them together. It doesn’t have to be perfect; it won’t be visible when pita is done. If making pita pie, the dough will eventually cover the tablecloth. Trim the thick outer edges and discard. Drizzle pastry all over with oil. For individual pitas, spread some of the meat filling over the pastry, then continue to the next step. 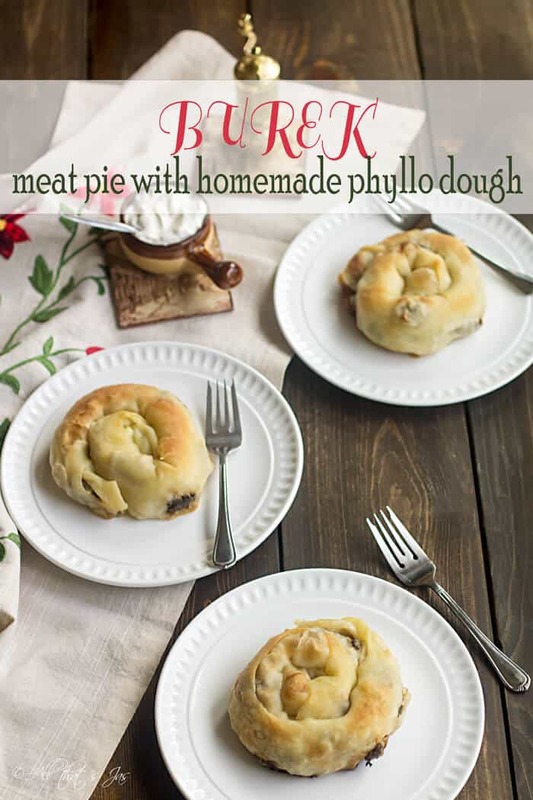 For pita pie, put half the meat filling along the long edges of the pastry, leaving a one-inch border. Start to roll the dough on one side by lifting the tablecloth towards the middle into a long, thin log. If making a pita pie, lift up on both sides of the tablecloth then cut the dough between the two logs with a knife. Tightly coil the small individual pita rolls into a swirl. Place into a greased baking dish. For the pita pie, lay one end of the roll into the middle of a greased large round baking pan. Carefully wrap the remainder of the pastry roll around itself to form a snail-shaped pie. Take the second roll and continue where the other roll had ended. (If you don’t have a round pan, then don’t coil, just cut the roll the length of your rectangular baking sheet and place next to each other). Repeat stretching and rolling with remaining dough and filling. Bake for 35 to 45 minutes or until the top and base are crisp and golden. Optional: Bring one cup water and one tablespoon butter to a boil and drizzle over pita when done baking. Thin, flaky dough known as phyllo (or yufka) filled with mincemeat is delicious and popular Balkan food. In a large bowl, whisk flour and salt to combine (with this method sifting flour is not necessary). Make a small hole in the middle and add water and two tablespoons oil. Start mixing slowly from the middle out, using your fingers or a wooden spoon (I prefer fingers as I have better control and feel for it). Keep adding flour to the middle until mixture forms soft dough that isn’t sticky. Note: Depending on air humidity, you might have a little bit flour left over or you might need to add some more. Dough should look similar to pizza dough. 1. Remove the rested dough to a lightly floured work surface. Divide into 4-6 smaller even pieces for individual pitas or into 2 balls for one large pita pie. Knead each ball until smooth for about two minutes. 2. Using rolling pin, roll out rounds to a flat circle. Coat each piece with more oil. 3. Take one round of dough and place the edge over your floured fists so the rest hangs in the air. One at the time, move your hands up and down to rotate the dough (similar to the way pizza makers do), working your way around the edge of the dough until its weight allows it to stretch into a larger piece. When it’s too large to handle, place it on the tablecloth. If you are intimidated with this method, just use rolling pin to stretch the dough as thin as possible without breaking it and then continue to step 5. 4. Preheat oven to 375 degrees Fahrenheit. 5. Using your fingers, gently shake and pull the edge of the dough towards you to stretch out the center, until it’s even and transparent. Take care not to tear holes in the dough. If you do, pinch them together. It doesn’t have to be perfect; it won’t be visible when pita is done. If making pita pie, the dough will eventually cover the tablecloth. Trim the tick outer edges and discard. 6. Drizzle pastry all over with oil. For individual pitas, spread some of the meat filling over the pastry, then continue to the next step. For a pita pie, put half the meat filling along the long edges of the pastry, leaving a one-inch border. 7. 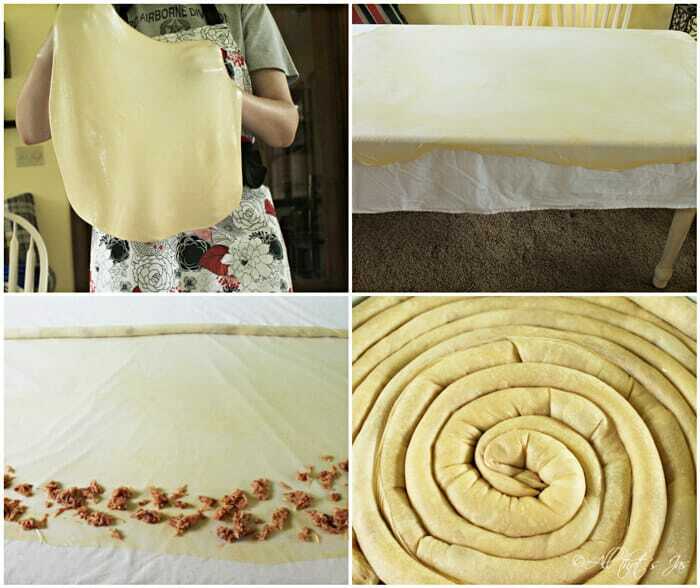 Start to roll the dough on one side by lifting the tablecloth towards the middle into a long, thin log. If making a pita pie, lift up on both sides of the tablecloth then cut the dough between the two logs with a knife. 8. Tightly coil the small individual pita rolls into a swirl. Place into a greased baking dish. For the pita pie, lay one end of the roll into the middle of a greased large round baking pan. Carefully wrap the remainder of the pastry roll around itself to form a snail-shaped pie. Take the second roll and continue where the other roll had ended. (If you don’t have a round pan, then don’t coil, just cut the roll the length of your rectangular baking sheet and place next to each other). 10. Repeat stretching and rolling with remaining dough and filling. Phyllo pastry can be filled with vegetables, cheese and even fruit. Thanks, Katie! 🙂 Blessings and bear hugs!! Ha, ha…da znas koliko sam ih napravila dok nisam potrefila…a ko magarac, navalila svaki vikend praviti. Ukucani se nisu bunili, naravno hehe. This sounds really delicious- I wish it was my lunch today! Me too, lol. I need to make more next time and freeze it. Thank you for visiting and have a beautiful day! Oooh that looks amazing!!!! 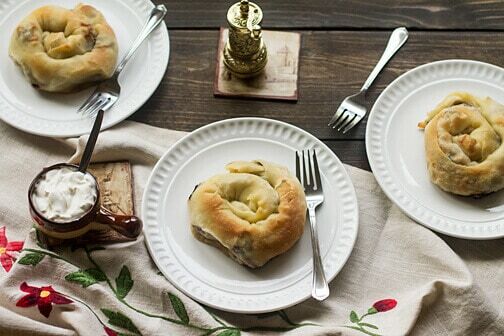 I have never been brave enough to make homemade phyllo (the whole idea of rolling out a super thin dough terrifies me; I feel like I wouldn’t be able to pinch together and fix all the tears haha), but these look really delicious! Yum! These look wonderful! I love anything made with Phyllo! Baklava is my favorite! I was “parked” by you today on Waiting on Wed., and I’m glad to find your site. Hi, Melanie. Thanks for stopping in, I hope to see you on Thursday Favorite Things again 😀 And, baklava is my favorite too! Blessings! Hi, Jess! No, I haven’t tried making it with wheat flour. Let me know how it turned out 🙂 Thanks for stopping in! Wow, this sounds good! Thanks for sharing at My Flagstaff Home! Now that I have some practice, I’m making them often. Nobody complained…yet, lol. Wow! This looks so divine…double yum. Thanks for sharing your recipe with us at Funtastic Friday. Thank you, Sherry! 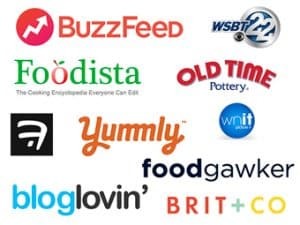 Btw, love your new logo!